There has never been a better time to be in Recruitment. Not even the heady days of the pre-recession era can come close to the size, rate of growth and overall enthusiasm that exists in the sector today; and there is little sign of it waning anytime soon. According to figures released by Companies House, the number of recruitment agencies registered as trading businesses has increased from 12,000 in 2012 to a staggering 29,000 today…and counting. Despite the uncertainty that is Brexit, employer confidence remains positive with a quarter of hiring managers planning to increase their headcount in the coming months. Add the REC’s predictions that 56% of all vacancies will be filled by Recruitment agencies at the end of 2018 and it becomes clear why so many ambitious recruiters fancy their chances of becoming a successful recruitment entrepreneur. And many of them become just that – successful. The need to drive efficiencies is nothing new. However, against a backdrop of growing competition and the increased need for agencies to watertight their compliance obligations, lately it has taken on an even greater importance. Trouble is that many existing recruitment technologies that agency owners depend upon are fast-becoming costly to continually update. Not to mention their increased complexity. Even then, it certainly doesn’t help that functions are spread across multiple platforms. It is estimated that the average recruiter spends around four hours each week updating their agency’s systems. What’s more, two-thirds of recruiters are reporting that the transfer of data from one system to another has a detrimental impact on client relationships and the ability to make the right decisions to help grow their business. But that is about to change. 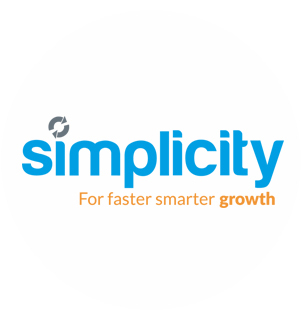 After three years in the making and a multi-million-pound investment, the UK’s leading recruitment finance and back office provider Simplicity have developed their unique Recruitment CRM and workflow solution – GEMS. GEMS is an innovative end-to-end recruitment technology solution that combines front and back office systems into one seamless process. Its purpose is a simple one – to help busy recruiters save time and become more efficient when running their agency. And the real plus is that it is completely FREE for all Simplicity Partners. With GEMS, there is no transfer of data across multiple systems. Neither is there a need for double keying, which means that recruiters save time and reduce the risk or errors. This in turn can improve both client and candidate relationships. As a cloud-based system, GEMS provides the end user with a seamless and straightforward process from candidate and client management (CRM) right through to live management information, such as debtors, AWR and gross margin reports. The system facilitates online or paper timesheet processing, takes care of your payroll and HMRC obligations and also generates your client invoices. Branding the system to look like your own through the customisable function means you can compete with the bigger agencies and attract new clients. You can even provide clients and candidates with logins to their own GEMS portal where they can access CV workflow, download copies of invoices or payslips and view reports. It’s also completely scalable to allow recruitment businesses to grow. Plus, it’s configured to both Temporary and permanent recruitment. Recruitment technology is constantly evolving and GEMS truly is at the forefront of this evolution. Unique in every way, there is no other system like it. GEMS enables recruiters to manage everything via a single solution. For the first time, recruiters can avoid being involved in time-consuming administrative tasks that use up valuable time. Time that could be spent on business development. In an era when competition between recruitment agencies is at its highest, time lost to non-billable tasks can be costly. Indeed, if you’re a recruitment agency owner with ambitions to grow, the loss of four hours each week per consultant can very easily put paid to those plans. GEMS technology enables agencies to effectively streamline their business by saving recruiters vital administration time. This in turn makes them more efficient, puts them ahead of the competition and reduces their overall costs, via the FREE solution. GEMS can help recruitment businesses achieve faster, smarter growth. If you are looking to reduce your costs, save time and become more efficient, then maybe GEMS is the answer?